Johnson controls produces components for the automotive industry all over the world. An important branch of production are automotive multimedia systems, either consisting of a DVD player and two TFT displays for integration into headrests or consisting of a fold-out TFT display so be mounted to the car ceiling. The automotive industry requires high quality of all products and short tooling and down times for their tester systems. 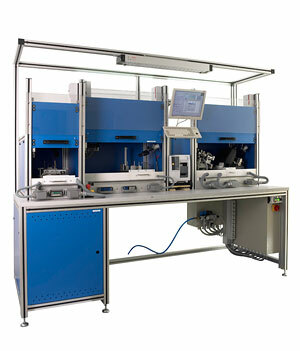 Therefore, tester systems have to work especially reliable and flexible. Hardware and software have to allow for uncomplicated modification according to the demands of new products and variants. Because Johnson Controls is a globally operating enterprise, worldwide availability of all components of a tester system is a special concern. The required test stand has to conduct 100% testing of DVD players and TFT displays as an end-off-line-tester system (EOL). It also has to check all electric connections and to conduct optical and mechanical tests. Based on these requirements, the tester system has been implemented as a scalable TAVT-based (telecommunication, audio, video und telematics) platform. Because of the high number of available PXI modules, the tester can be optimally adjusted to the requirements of each device under test. Testing adaptors inside the testing compartments for DVD players and TFT displays and PXI cards are connected to each other via a comprehensive electronic interface. Devices under test are powered by means of high-quality,programmable power supply units with a GPIB interface. The application of TestStand ensures a modular and flexible software structure. Due to the long-time experience in the development of tester systems, testing libraries for audio and video tests, various communication interfaces, vision tests and digital I/O have been generated, that could be implemented into TestStand as custom StepTypes. Because of such StepTypes, no special programming skills are required for the tester system, because all test steps can be configured. This TestStand environment has been complemented by several service tools, such as a limit editor. The Display Test Toolkit can be integrated into TestStand and offers comfortable, configurable StepTypes, as well. It allows for simple configuration of each test step and for uncomplicated alteration of testing sequences so that the system can be adapted according to changing demands. The Display Test Toolkit offers testing sequences for colour and contrast testing, detection of faulty pixels, icon and character recognition and display orientation testing. The hardware concept is based on a PXI-1045 chassis including a PXI-8176 controller with GPIB interface and a multifunctional PXI-6052 card for analogue measurement and signal generation. The chassis also comprises a PXI-5431 for the generation of video signals for display testing, a PXI-1411 for optical inspection and a PXI-8420/4 for testing various serial interfaces. Bus systems, such as CAN bus high speed, CAN bus low speed and LIN bus are supported by the tester. It also comprises complex interface electronics like an SDR rack (Signal Distribution Rack), whose core consists of various GPIO cards (General Purpose IO) such as a power control unit, a signal control unit, a video multiplexer and a video demultiplexer. For the implementation of all required test and measurement sequences, new TestStand StepTypes have been developed and existing StepTypes have been applied, whenever they were suitable. This way, libraries of functions for audio, video and digital I/O measurement could be extended. All these StepTypes have been complemented by special test steps, for example for homogeneity testing of displays or for mechanical button tests. Each TestStep can be parameterized by means of an interactive configurations window. Testing functionality and configurations windows have been implemented by means of LabVIEW or rather LabWindows/CVI and have been complemented by a customized operator interface and several service tools (such as an SPC tool, a database connection and camera adjustment). Because of its modular and structured concept, the TAVT platform could be used for fast and cost-efficient implementation of a tester for rear seat entertainment systems. Due to the scalable tester concept, the customer decided, to replace another existing tester for a different product with a modified version of the new multimedia tester. Based on the same concept, another tester has been implemented, testing contacting and functionality of displays integrated into car seats. Six of these testers have been assembled in a US facility of Johnson Controls.